Here, resting on a black steel chair, is a hat of unnerving spirit. 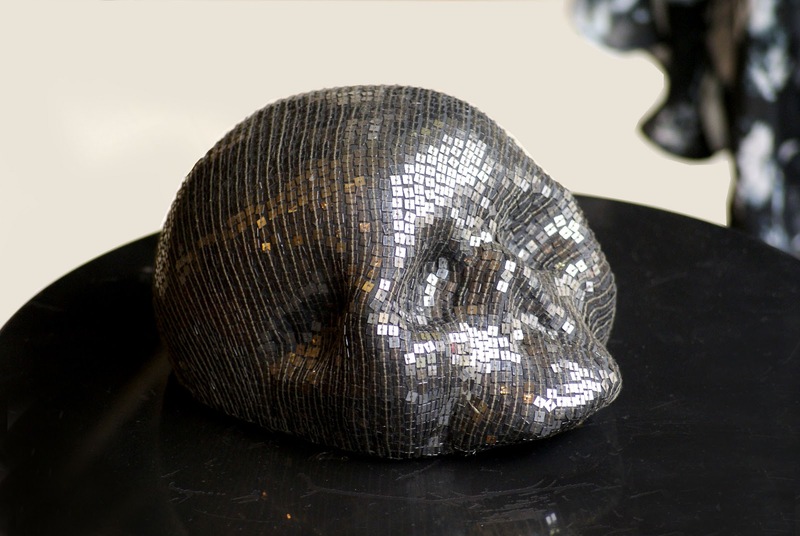 The geography of the skull is molded in thick, dense fabric to hold anatomical precision, and over this is sewn hundreds of small black plastic squares. These glint, provide a fingertip texture, and suggest intricate, hand-placed mosaic work. The hat is from Belgian designer Christophe Coppens who is so fondly known in his country as the ‘mad hatter’; the designer who thrills audiences with his ‘dark silliness’. Certainly thrilled was a global audience who saw singer Rihanna wearing one of his hats which sported a large, jewel-studded dagger. Coppens’s work is obviously based on the theatrical, but so well crafted and so full of gathered references that it slips easily into the arena of couture. The hats also have the unapologetic propensity of becoming the main focus of an outfit - a result of both the invention, and the silhouettes they throw. This sequined ‘skull hat’ is at Scotties, 4 Blair Street, Wellington.